A hawk perches in our pond-side willow in the rain. This morning in Huntington at 6:55AM it’s currently 36 degrees under mostly cloudy skies. Winds are calm. Relative humidity is 98%, dewpoint 36, barometric pressure 29.891” and rising. Yesterday’s high was 61, and the overnight low was 32. Variable clouds, dry weather and seasonably mild temperatures will be the rule across the region through Saturday as weak high pressure remains in place across the region. We’ll see partly sunny skies today with highs in the lower 60s and light and variable winds, becoming northerly around 10 mph in the afternoon. Tonight should be mostly cloudy with a slight chance of showers after midnight. Lows will be in the lower 40s with northeast winds around 10 mph until midnight, becoming light and variable. Chance of rain is 20%. Friday should be mostly cloudy with highs in the lower 60s and light and variable winds. Friday night should be partly cloudy with lows around 40 and light and variable winds. A warm southerly airflow pulls in for Saturday brining partly cloudy skies with highs in the upper 60s to near 70. Saturday night should be partly cloudy with lows in the mid 40s. At this point it’s looking like Sunday will be near 70 as well! Last year on this date we had a high of 46 and a low of 39. We picked up 0.08″ of rain. Burlington norms for this date are highs of 62 and lows of 40. The Moon is waxing gibbous, 11d 16h old with 88% illumination. 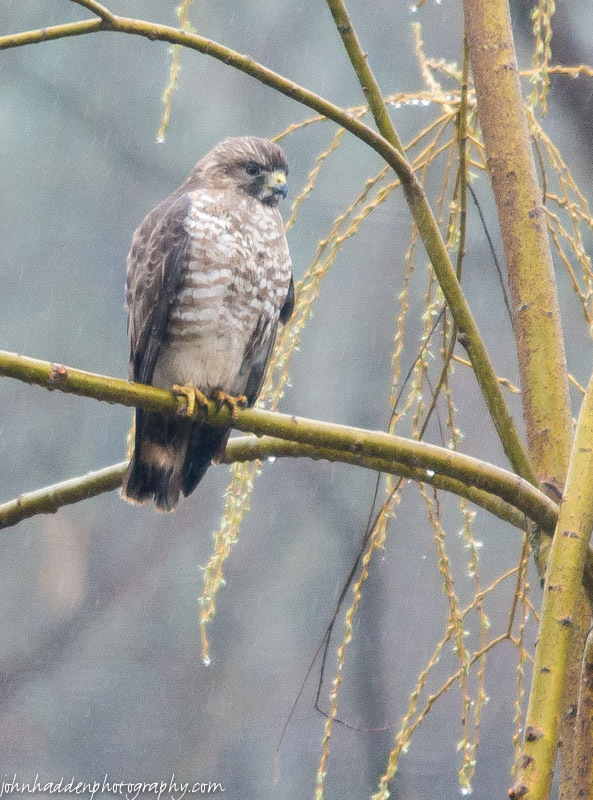 This hawk was hanging out in the willow next to our pond the other day in the rain. I’m not quite sure what kind it is, perhaps a juvenile red tailed? Anyone care to identify it for me? 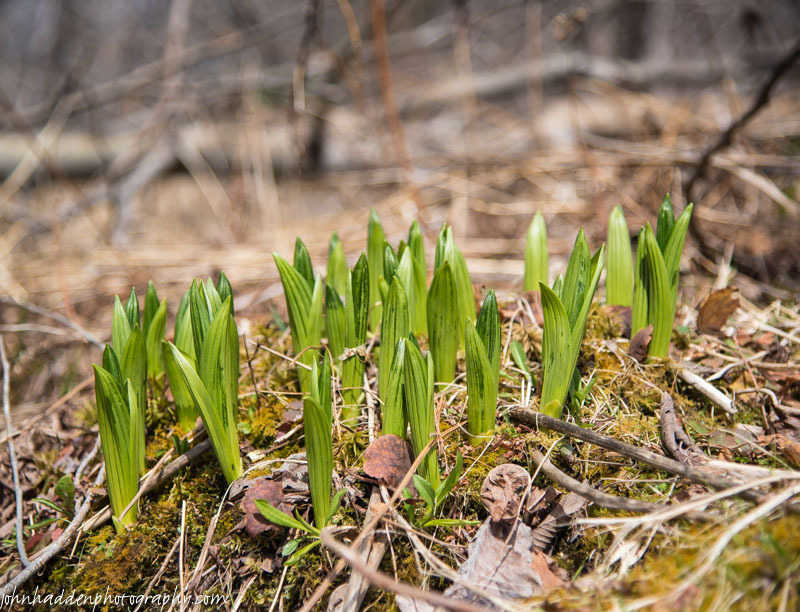 False hellebore sprouting in a wetland along Taft Road. This morning in Huntington at 6:55AM it’s currently 33 degrees under partly cloudy skies. Winds are calm. Relative humidity is 98%, dewpoint 33, barometric pressure 29.72” and rising. Yesterday’s high was 56, and the overnight low was 32. Weak surface high pressure will dominate our weather for the next couple of day. We’ll see partly sunny skies this morning, then mostly cloudy skies later in the day. Highs will be in the upper 50s to near 60 with north winds 10 to 15 mph. Tonight should be partly cloudy with lows around 40 and north winds around 10 mph until midnight, becoming light and variable. Thursday should be partly sunny with highs in the lower 60s and light and variable winds, becoming northerly around 10 mph in the afternoon. Thursday night should be mostly cloudy with lows in the lower 40s and east winds around 10 mph. Friday’s looking mostly cloudy with highs in the lower 60s and light and variable winds. Friday night should be partly cloudy with lows in the lower 40s. Last year on this date we had a high of 58 and low of 41. Burlington norms for this date are highs of 61 and lows of 40. The Moon is waxing gibbous, 10d 16h old with 81% illumination. False hellebore (Veratrum viride) is an early riser this time of year, popping up in soggy wetlands and along streams in the early spring. This batch was growing in a wide wetland along Taft Road. This morning in Huntington at 6:00AM it’s currently 32 degrees under mostly cloudy skies. Winds are calm. Relative humidity is 97%, dewpoint 32, barometric pressure 29.84” and rising. We picked up 0.25” of rain in the past 24hrs. Yesterday’s high was 46, and the overnight low was 32. The pesky low pressure system which has brought cool and cloudy weather to the region over the past week will finally begin to lose its influence over us today with mainly dry weather and warmer temperatures expected. We’ll see mostly cloudy skies with highs in the mid 50s and north winds 10 to 15 mph gusting up to 30 mph. Tonight should be mostly cloudy until midnight, then clearing. Lows will be in the upper 30s with north winds 10 to 15 mph. Wednesday should be partly sunny in the morning then become mostly cloudy. Highs will be in the upper 50s with northwest winds around 10 mph. Wednesday night should be mostly cloudy with lows in the lower 40s and northeast winds around 10 mph. Thursday’s looking partly sunny with highs in the lower 60s and northeast winds around 10 mph. Thursday night should be mostly cloudy with lows in the lower 40s. Last year on this date we had a high of 53 and a low of 32. We picked up 0.09″ of rain. Tomorrow will be 2m43s longer. The Moon is waxing gibbous, 9d 15h old with 72% illumination. There are certain places in the area where I can be assured that some of the earliest spring ephemeral wildflowers will make a showing. 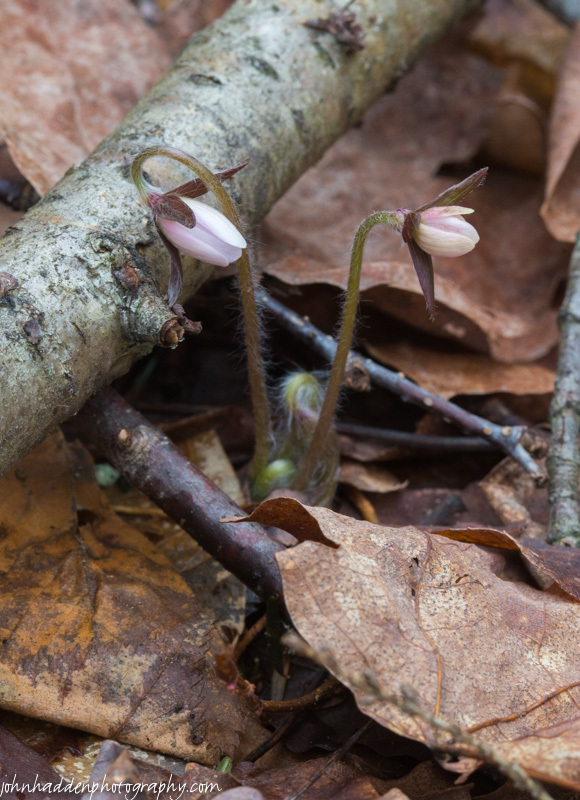 I was not disappointed when I walked to where the hepatica bloom. This little pair was making a go of it on a chilly morning just a couple of days ago. Nikon D600, Sigma 105mm lens, ISO 1600, f/18, 1/125″ exposure. This morning in Huntington at 6:20AM it’s currently 40 degrees and raining lightly under overcast skies. Winds are out of the south at 0-4 mph. Relative humidity is 96%, dewpoint 39, barometric pressure 29.67” and rising slowly. We picked up 0.13” of rain overnight. Yesterday’s high was 50, and the overnight low was 40. The “Omega Block” that has set up to our north and east persists to deliver cool, moist air to our region (for a good discussion of the Omega block, check out the Eye On The Sky’s Facebook page.) We’ll see rain showers today. Highs will only be in the upper 40s with north winds 10 to 15 mph. Chance of rain is 70%. Tonight should be cloudy with a 50% chance of showers, mainly until midnight. Lows will be around 40 with north winds 10 to 15 mph gusting up to 30 mph. Tuesday should be mostly cloudy in the morning, then becoming partly sunny. Highs will be in the mid 50s with north winds 10 to 15 mph gusting up to 30 mph. Tuesday night should be partly cloudy with lows around 40 and north winds 10 to 15 mph. We’ll finally see a break in the pattern on Wednesday as a weak shortwave ridge of high pressure moves though bringing partly sunny skies with highs in the lower 60s and north winds around 10 mph. Wednesday night should be partly cloudy with lows in the lower 40s. Last year on this date we had a high of 44 and a low of 34. We picked up 0.38″ of rain. Burlington norms for this date are highs of 60 and lows of 39. The Moon is waxing gibbous, 8d 15h old with 64% illumination. The snowstorm of December 10 did a lot of damage to trees (as the chorus of weekend chainsaw warriors can attest…) and many a branch and crown are lying on the forest floor. 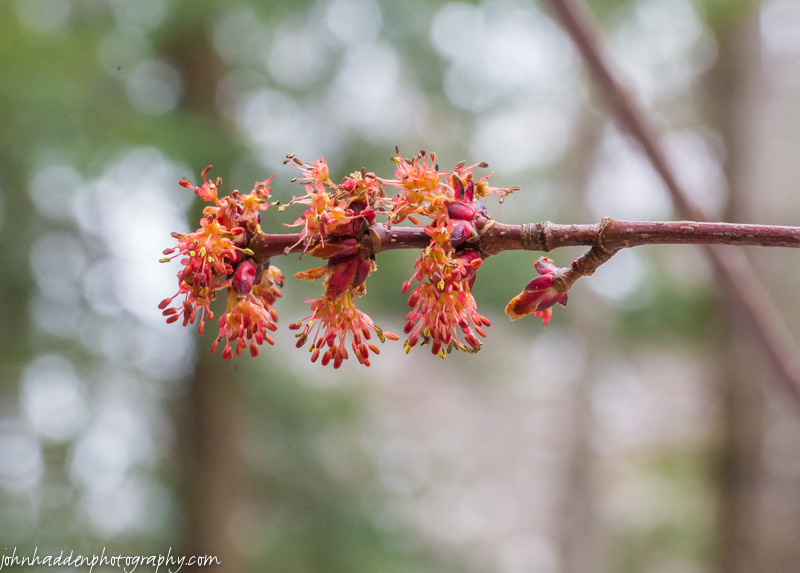 But even snapped off from the rest of the tree, many are still budding out like this red maple crown I came across the other day in the woods behind the house. Nikon D600, Sigma 105mm macro lens, ISO 1600, f/16, 1/200″ exposure. This morning in Huntington at 7:30AM it’s currently 40 degrees under overcasts skies. Winds are calm. Relative humidity is 87%, dewpoint 37, barometric pressure 29.71” and rising. Yesterday’s high was 45, and the overnight low was 38. The low pressure system that’s been rotating cool, damp air into our region has moved off the coast of Maine and into the north Atlantic. However, it’s not completely done with us as we’ll see another day like yesterday, albeit a tad warmer. We’ll see cloudy skies this morning, then partly sunny skies with a 30% chance of rain showers this afternoon. Highs will be in the lower 50s with light and variable winds, becoming northwesterly around 10 mph this afternoon. Tonight should be cloudy with a 40% chance of showers. Lows will be in the upper 30s with northwest winds around 10 mph until midnight, becoming light and variable. Monday rain showers are likely. Highs will be around 50 with north winds around 10 mph gusting to 30 mph in the afternoon. Chance of rain is 70%. Monday night should be cloudy with a 50% chance of showers. Lows will be around 40 with north winds 10 to 15 mph and gusting up to 30 mph. Tuesday’s looking partly sunny with highs in the mid 50s and north winds 10 to 15 mph and gusting up to 25 mph. Tuesday night should be partly cloudy with lows around 40. Last year on this date we had a high of 55 and low of 40. We picked up 0.11″ of rain. The Moon waxing gibbous, 7d 16h old with 55% illumination. 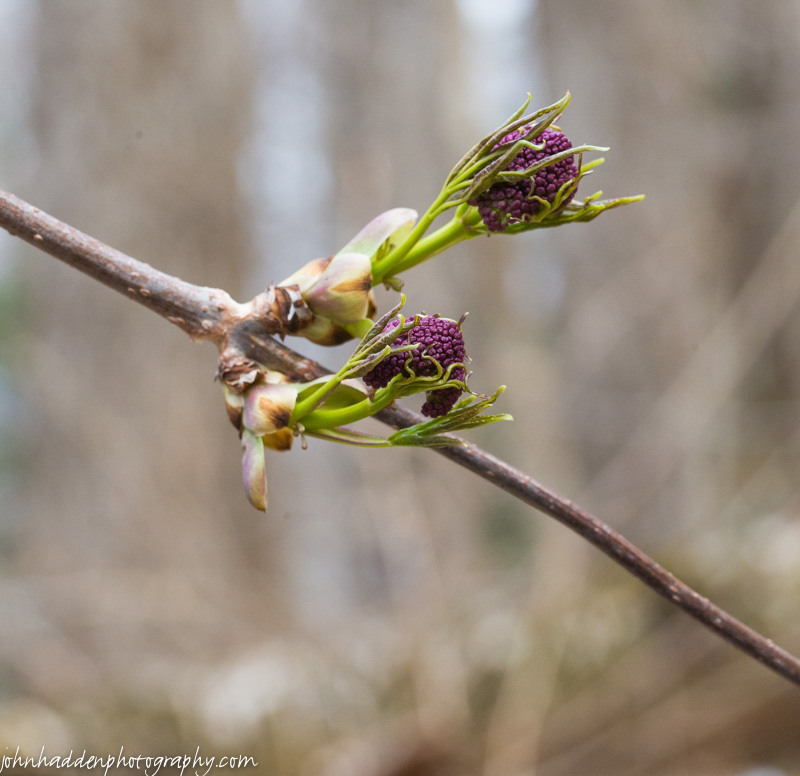 I came across this red-berried elder popping out in the woods yesterday. It was growing on the upturned rootball of a toppled spruce. Thanks for the ID Everett! This morning in Huntington at 7:35AM it’s currently 32 degrees under overcast skies. Winds are calm. Relative humidity is 74%, dewpoint 25, barometric pressure 29.82”. Yesterday’s high was 35, and the overnight low was 32. If yesterday’s weather suited you, then you’re in luck because today is going to be nearly identical. The stubborn low pressure system over Maine continues to circulate damp chilly air across the region. We’ll see cloudy skies with chance of snow or rain showers this morning, then a chance of rain showers this afternoon. Highs will be in the mid 40s—perhaps a bit warmer than yesterday—with northwest winds 10 to 15 mph. Chance of precipitation is 50%. Tonight should be cloudy with a 40% chance of rain showers mainly until midnight. Lows will be in the mid 30s with northwest winds around 10 mph until midnight, becoming light and variable. Sunday should be cloudy with a 40% chance of rain showers. Highs will be in the lower 50s with light and variable winds, becoming northerly around 10 mph in the afternoon. Sunday night should be mostly cloudy with a 40% chance of showers. Lows will be in the upper 30s with northwest winds around 10 mph. Monday rain showers are likely. Highs will be in the lower 50s with north winds around 10 mph gusting up to 25 mph. Chance of rain is 60%. Monday night should be mostly cloudy with a 40% chance of showers. Lows will be in the upper 30s. Last year on this date we had a high of 57 and a low of 25. Burlington norms for this date are highs of 60 and lows of 38. The Moon is a waxing crescent, 6d 16h old with 45% illumination. 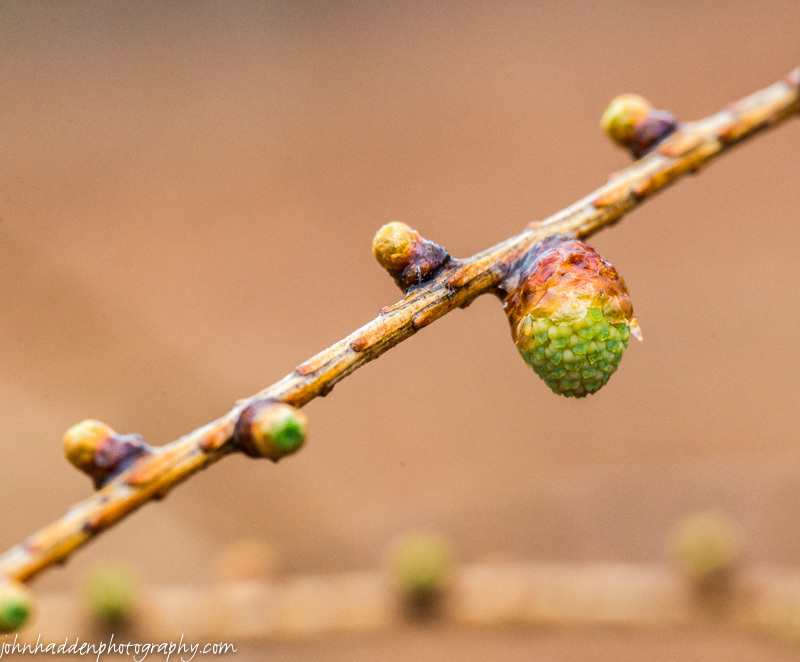 The larch in our front field is budding and setting a new cone as well. Nikon D600, Sigma 105mm macro lens, ISO 1600, f/13, 1/500″ exposure. This morning’s light covering of snow will not deter the daffodils! This morning in Huntington at 6:55AM it’s currently 32 degrees under overcast skies. A few lazy snowflakes are drifting down. Relative humidity is 83%, dewpoint 28, barometric pressure 29.78” and rising. We picked up 0.02” of rain and 1.25” of snow overnight. Yesterday’s high was 42, and the overnight low was 30. The stubborn low pressure system that’s been bringing us our current round of cool and damp weather is parked over Maine this morning and will continue to rotate more of the same into our region for the next couple of days. We’ll see cloudy skies with a 50% chance of snow or rain showers this morning, then a chance of rain showers this afternoon. Highs will be in the lower 40s again today with northwest winds 10 to 15 mph. Tonight should be cloudy with a 50% chance of rain or snow showers until midnight, then a chance of snow showers after midnight. Lows in the lower 30s. Northwest winds 10 to 15 mph with gusts up to 25 mph. Saturday should be cloudy with a chance of snow or rain showers in the morning, then a chance of rain showers in the afternoon. Highs will be in the upper 40s with northwest winds 10 to 15 mph. Chance of precipitation is 50%. Saturday night should be mostly cloudy with a 40% chance of rain showers. Lows will be in the mid 30s with northwest winds around 10 mph. Sunday’s looking partly sunny with a 40% chance of rain showers. Highs will be in the lower 50s with northwest winds around 10 mph. Sunday night should be partly cloudy with a 40% chance of showers. Lows will be in the mid 30s. Last year on this date we had a high of 51 and a low of 32. We picked up 0.03″ of rain. Burlington norms for this date are highs of 59 and lows of 38. The Moon is a waxing crescent, 5d 16h old with 35% illumination. 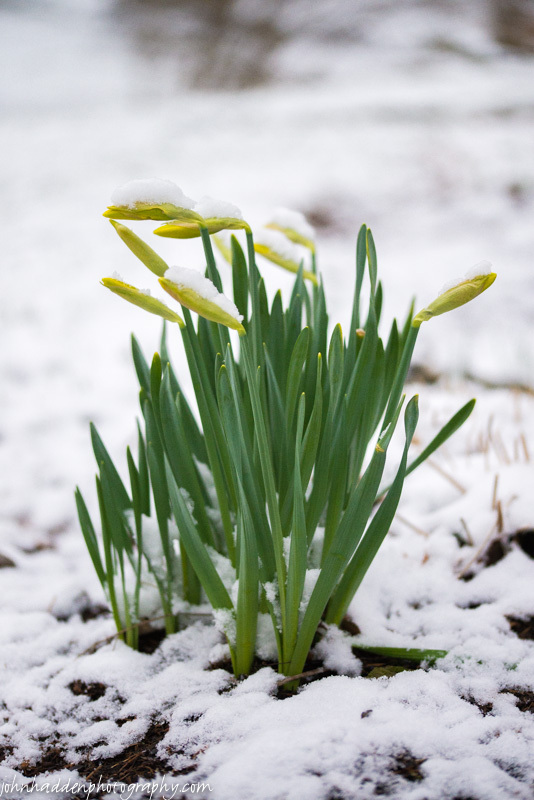 One of the clumps of emerging daffodils by the side of the house is undeterred by this morning’s snowfall… Spring will win!